Welcome in the 3rd edition of this article, which is devoted to learning some basic issues regarding following the exact route, when you make up your face. 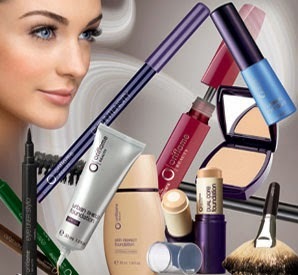 In the previous two parts, we have been talking about applying a Makeup Primer, Concealer and Foundation. These three steps, for me, present the base of every makeup, regardless of the occasion or regardless of your decision whether you'll continue with makeup or not. We are all pretty much aware of the fact, that occasionally, we are tired or simply aren’t in the mood (or we just too lazy :-P) to continue with further applying our makeup. And, that’s totally normal. Even I, occasionally, have these awkward moments, when I just apply my favorite lip gloss or balm and then, simply, finish with my makeup. On these occasions, I recommend for you two amazing products, from Oriflame, and these are: “The ONE BB Lip Balm” and “The ONE Power Shine Lip Gloss”. My favorite shade, when we are speaking about lip gloss, is Soft Coral, I simply adore it :-)! For these very special occasions, in which is inspected by us to be just perfectly makeup (when aren’t feeling too lazy or the occasion requires of us to look stunning), check out these (further) steps in make-up. Yes, I am very well aware that I should include the applying of the Loose Powder, into my “base of makeup”, but I am simply too lazy (or I have accustomed to, deliberately, “forget” to apply it :-P :-)). Although, I DO recommend its use (in the rare occasions, when I accidentally bethink to use a loose powder I prefer a translucent anti-preprint, than the ordinary one). The thing is quite simple, if you desire to maintain your foundation in a perfect shape, for a bit longer period of time, then you should include, in your make-up routine, applying a loose powder. I can suggest you to try “Very Me No Time for Shine Powder”, although I haven’t got a chance to try it (like I’ve, already, said, (although I know that it’s terribly wrong) I try really hard to avoid that step :-)), my customers are thrilled with its effectiveness. The next step presents applying your favorite shade of blush. But, be aware that it’s entailing a few problems. One presents opting for the appropriate shade, and the other is regarding the method of application. Although, they don’t seem that on the very first glance, both of them can be pretty tricky. When it comes to opting the suitable shade, here’s how I am solving this problem out- I just pinched my cheeks and which color appears, that shade of blush I opt to shop :-). Pretty clever, don’t you think? I have, occasionally, the ace in my sleeve :-P. Recently, I’ve discovered the perfect one, in one of Oriflame’s brochures “The ONE IlluSkin Blush” , which I found just perfect. It has been produced in three shades, which guarantees that you will find a suitable shade according your skin tone. Because, the lack of space, I promise, that I’m gonna (in the next, 4th part, on this, let’s call it, “make-up guide”) leave the proper method of application of the blush as well as, the finishing movements by applying your make-up. In order to become a real expert in make-up, you should follow me into the next edition :-)!